It is true that I’ve given sugar a well deserved bad name in past posts. And it is true that I stated that I couldn’t be counted on to provide dessert recipes. However, every rule has it’s exceptions. And, today is a good day for exceptions. Chocolate. Dark chocolate. 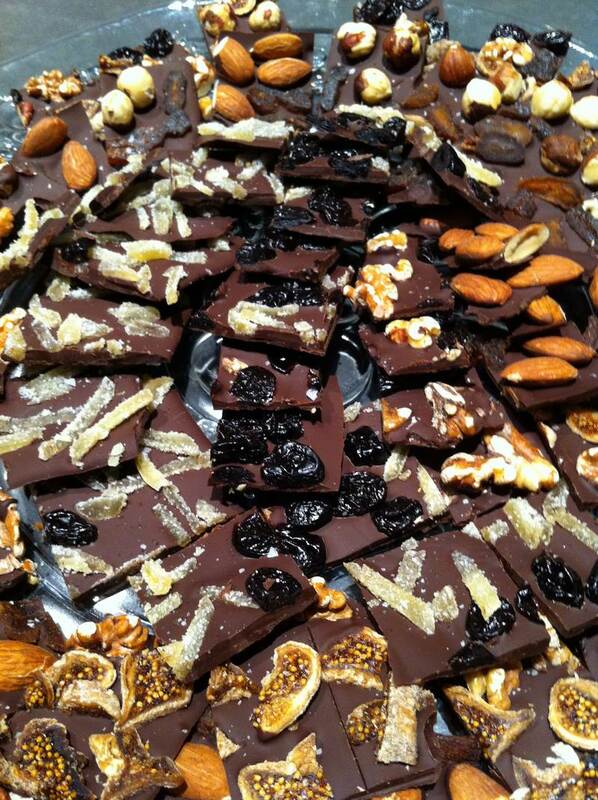 Dark chocolate with delectable dried fruits AND roasted nuts. The end. OK, not exactly the end. Here’s how to make it come to life. This recipe is adapted from the 2007 December Bon Appetit Test Kitchen version. It’s classic and classy. Use unsalted nuts, roasting them for 5-10 minutes in a 350 degree oven, in a baking pan, watching them and stirring them about making sure they don’t burn. 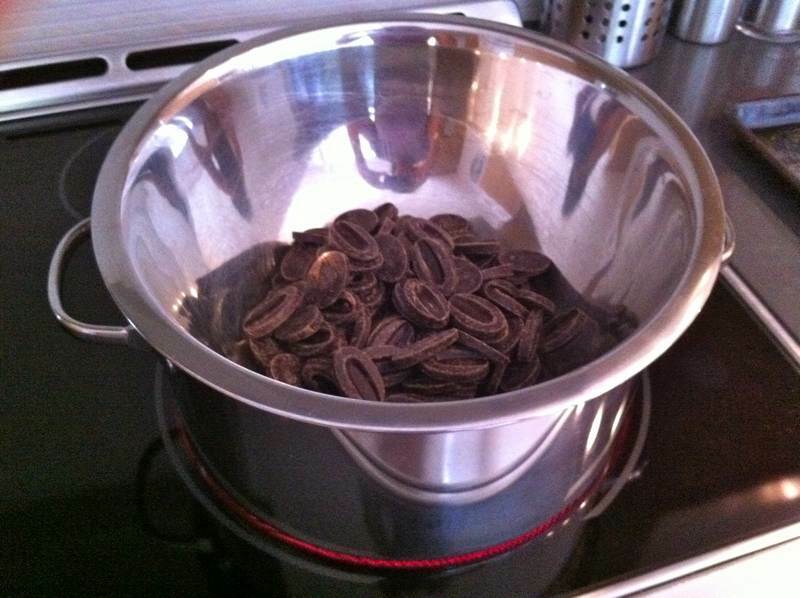 Stir the melting chocolate in a bowl suspended over a pot of simmering water. 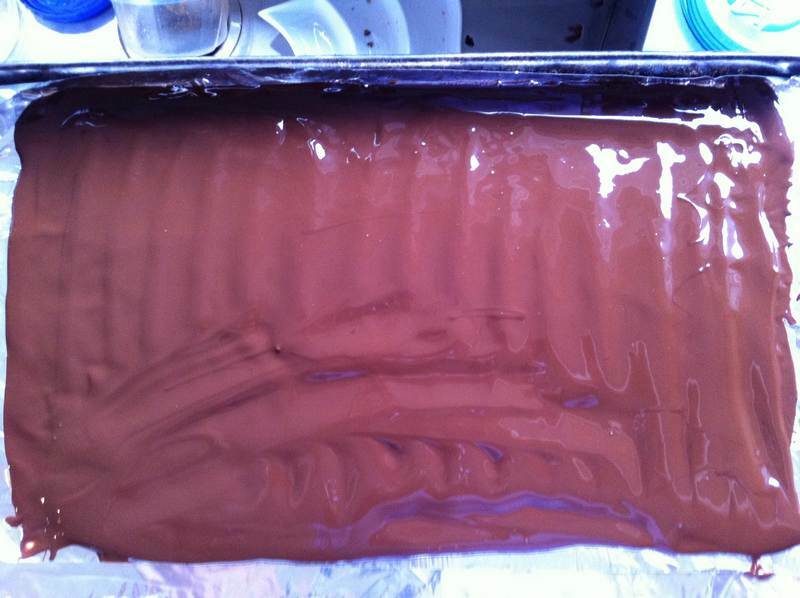 Cover your baking pan with tinfoil, then spread the chocolate in a 1/4 inch thin layer. 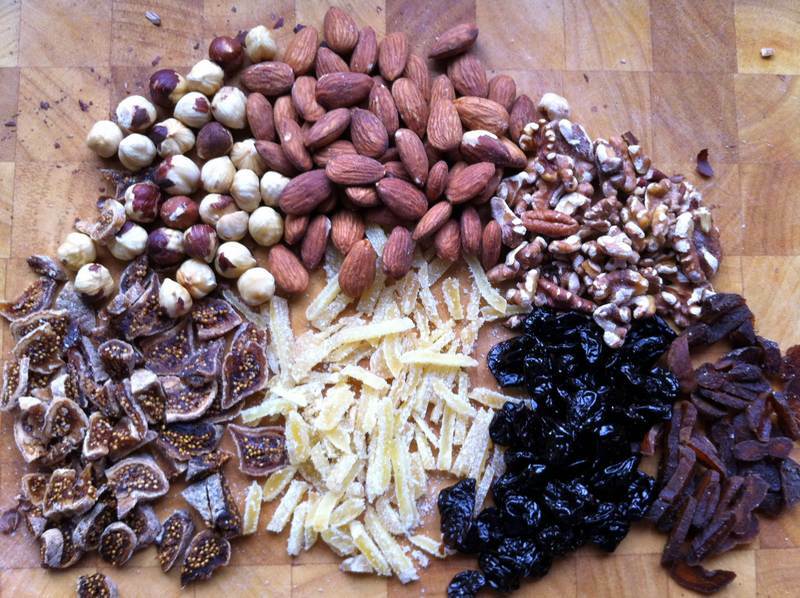 Scatter the nuts and fruit either helter skelter or in a pattern. Sprinkle with the scant amount of salt. Chill until you can break or cut it easily into whatever shapes you prefer. Refrigerate to chill faster if necessary. Your family and friends will bark for more. Dark chocolate has been credited with being healthy, yet another antioxidant. It isn’t often that such a tasty treat gets such high marks on the good health scale. Ginger is also touted for its numerous health benefits. 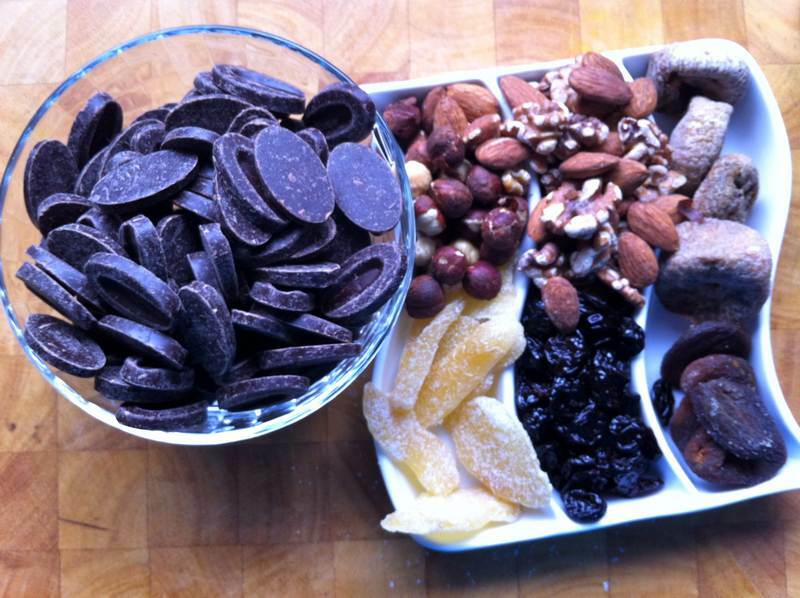 Thanks to Prana for wonderful organic dried fruit and nuts that render the chocolate bark extra tasty and healthy. To buy good quality chocolate; the bulk bin store next to Premiere Moisson, on the second floor of Atwater Market , has Valrhona or Callebaut, both are excellent quality. I neglected to note the name of this store. Anybody know it? Thanks to my lovely daughter Adrianne for licking the chocolate melting bowl, doing the dishes and being my #1 partner in enjoying Dark Chocolate Bark. I had the pleasure of tasting your home made bark and found it exceptional. I love the addition of the salt. It balaces the sweetness and makes it especially good. Now that I have the recipe I will be making it for my family too. Thank you! 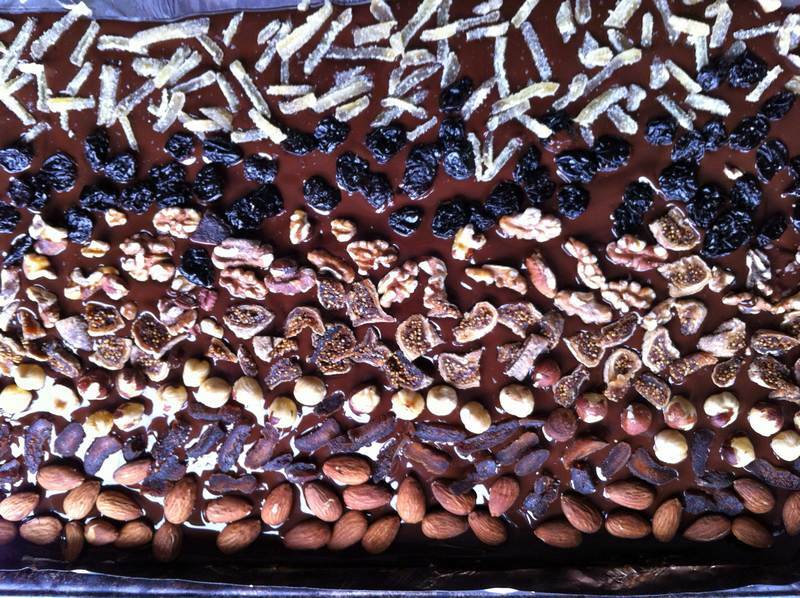 The roasted nuts, dried cherries and crystallized ginger also balance the sweetness. All I have to say about any of your cooking, blog entries, parties, or whatnots, is………………HAPPY BIRTHDAY TO A VERY SPECIAL GIRL!!! Love you, love you, love you!!!!! Love you too!!!! And not in a jittery fashion! Looks yummy. Any left? Bring it to book club! i’m thoroughly enjoying your postings. didn’t know it was your birthday……hope it was wonderful. many more……may all your wishes come true!